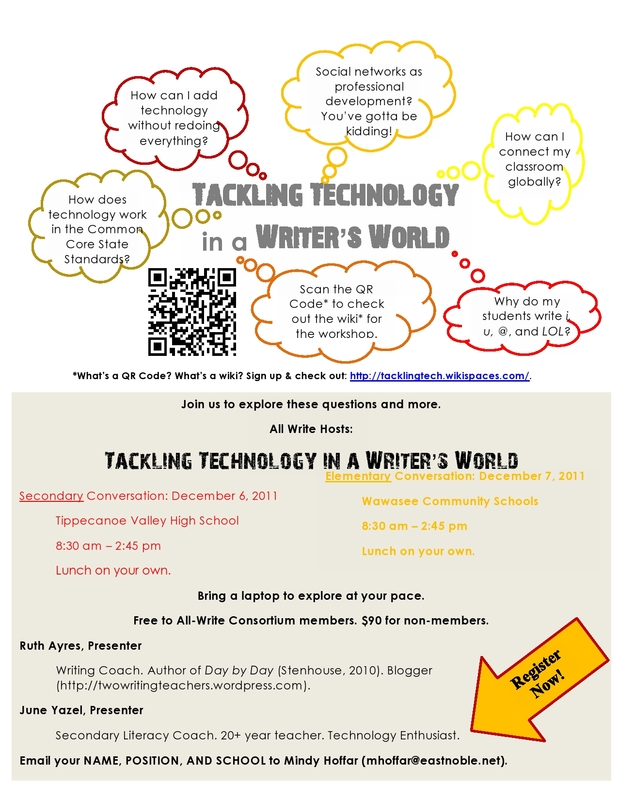 My friend June Yazel and I are putting together a workshop called: Tackling Technology in a Writer’s World. We are planning two different versions, one for elementary teachers and another for content area secondary teachers. Although similar, the secondary version will focus more on research and informational writing while the elementary version will focus more on using technology together and digital storytelling. There are a couple of cool things I want to share with you. First, we made a QR Code to put on the flier. I couldn’t believe how easy-peesy it was to create. Simple go to this QR Code generator, put in the website link, and clicky-click. Presto! A unique QR Code. It made our wheels turn, thinking about this simple way to begin adding a touch of multimedia to traditional reports. If you need a bar code reader for your smartphone, here is the app I use. If you know me, then you know you don’t have to ask if it is free — of course it is! A large part of the workshop is learning to use social networks as a means of professional development. So, we are planning to have two screens, one for the presentation and the other for a constant Twitter feed. We are looking forward to sharing Twitter with the participants so they can see and experience firsthand the reason why Twitter remains a go-to source for professional development for both June and me. We are also conscious about providing a enough information to keep the day moving, but also enough time for participants to get their feet wet with the technology and also envision how it will go in their own classrooms. This seems like a tall order. Anyway, here’s the workshop information. If you are local, I’d love to spend the day with you talkin’ tech! Wow! I want to come just to learn and understand. So glad you are doing this. 2. That all tech/writing workshops were like this. I just learned how to create QR codes as well. We are going to put one on a survey for our quant research class. Anyone who uses the QR codes instead of doing the paper-pencil version will save a lot of time since we will not have to manually input their answers. I love your flier, and it will be fun to hear more! I’m not big on QR codes, but anytime anyone jumps in to try something is worth shouting about. Really wish I was closer and could join you–sounds like a good workshop! Will you tweet during this–what will the hashtag be? Love your QR code flier! We are a tweeting 5th gr. classroom from the SF bay area. Follow us @highfillcrew where we share our learning and thinking daily. Wish I could join you for your workshop, just wanted to share my website that I created for a workshop I will be presenting this Saturday in Napa California at the Fall CUE conference. It is entitled Readers and Writers Workshop for the 21st century Learner. Your blog has added a lot of inspiration to the work I have done here. @Rick — I’m not sure. I checked it from my iPhone and it worked okay. Hmmm? I’d love for you to join us. We are looking for an interactive day — I’d love to pick your brain! @Linda — For you, comment friend, I’ll happily post about Twitter. Until then, check out some of my followers and follow them. Also, do you have a smartphone? If so, load the Twitter app. I do most of my tweeting from my phone. I just entered the missing punctuation and all was well. Might be a quirk with my reader. Hoping they loosen the reins for sub-money. Would love catching up and hearing what you have learned. I get to present Twitter and Facebook to our District Tech Committee this week. Ripe for change here. Hope to see you soon. Wow, wish I could attend. It sounds like lots of good learning. Thanks for the how-to about the QR code. I’ll be sure to share. Have fun with Twitter too. I’ve started but am really struggling with what to do with it. Maybe you can do a few posts? Great article but I am having trouble with the QR code. I have a reader on my iPad, and the link comes up to the wiki. The problem is that the colon in the URL appears to be missing so it will not connect directly. Checking with my Admin to see if they will spring me loose to come to one of your seminars. You know me, I’m an old tech-talker from way back.